Bathroom Renovation in Auckland can prove to be quite expensive. The key to staying within your budget is to not renovating your entire bathroom at once. Maybe you want to change the floors because they look shabby or perhaps the sink or add a modern touch to the entire bathroom. Whatever you choose make sure that you have visited a few showrooms around Auckland and are getting the best value for your money. A little research and a good company can show you that the best quality does not equate to ‘expensive’. We have put together 3 things that you should probably not skimp on when you renovate your bathroom. If you love your tiles then do not replace them. However, if you feel that they are dated and you want your floors to look different then going with a cheaper solution would not be the best option in the long run. The floors or tiles make or break a bathroom renovation. Your tiles have the power to make a small bathroom look larger or your large bathroom even smaller. Many design magazines suggest painting over your existing tiles as a cheaper option which in the grand scheme of things will cost you more. Instead compromise on a few other things in your bathroom but pay a little extra for new tiles to revamp your bathroom. Look for tiles that are of a good quality but perhaps not as expensive as their Italian counterpart. Replace your tiles and make your floors the focal point of your bathroom renovation. Having a nice hot shower at the end of a hectic day can almost feel like a spiritual experience. The right pressure, a good warm temperature and surface area of the shower head are the key ingredients for a good shower. So it is a no brainer that a good shower head is a must for your bathroom. When doing a bathroom renovation in Auckland, visit the local stores and look for a shower head which will suit your needs and bathroom. There are plenty of stores around Auckland that have a variety of shower heads that can in fact prove to be better than international brands. If you buy a water saving shower head, then it would actually be more economical in the long run. There can never be enough storage in a bathroom for all your family’s toiletries. Think storage when planning your bathroom layout. 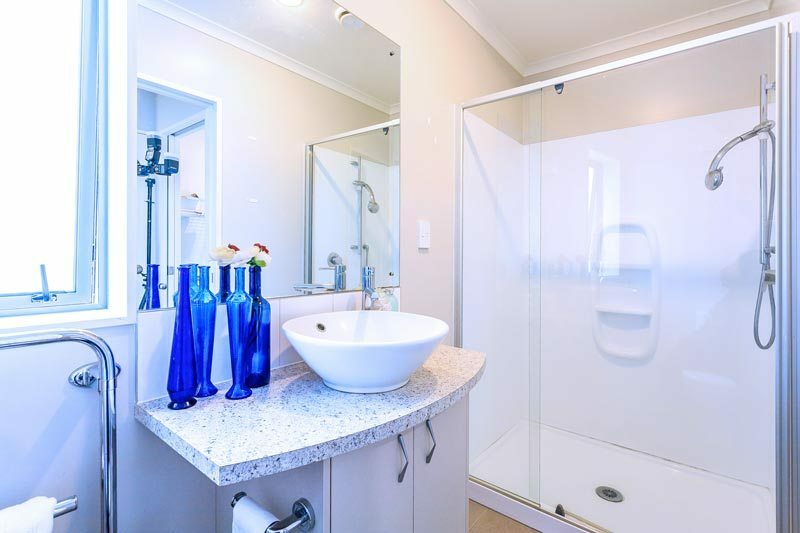 There are many options in Auckland when it comes to adding extra storage in bathrooms. Go to a few showrooms or ask renovation and design companies for design ideas if your aim is to add extra storage to your bathroom. Vanity Cabinets; add a mirror on your vanity so it can act as a good little storage area and a mirror. Open shelves along the wall: Open shelves can be used to store towels and other nick knacks without making the room look crowded. A thin v shaped corner cabinet: a cabinet such as this would be good for storing towels. If you feel like a closed cabinet might look cumbersome then add a mirror on the exterior of the cupboard to give an illusion of space.